I love this book. I am actually in trouble with our local library because I keep renewing it and I am way over my number of allowed renewals – I guess they imagine someone else might like to have a look! We need to unplug, kick back and enjoy activities that encourage us to spend quality time with our children, bonding as we learn new skills together. 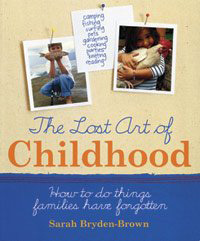 The Lost Art of Childhood introduces fishing, camping, knitting, cooking, surfing, pets, gardening, reading and real kid’s parties (just like we enjoyed as children). It includes insightful and humorous anecdotes retelling the author and her children’s ventures into each of these activities and useful information and resources for getting started with your own children. 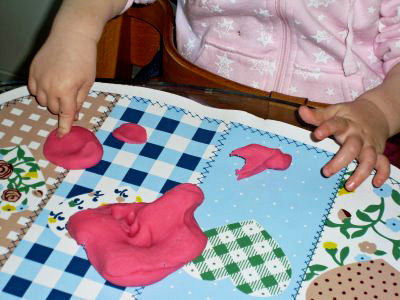 This week we test drove the cooked playdough recipe (see below). 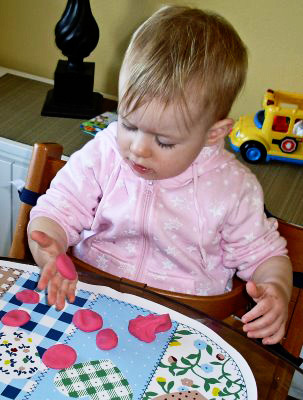 It was Immy’s first introduction to playdough and she really seems to enjoy it. Obviously at this stage, the experience is very sensory and exploratory rather than her being able to actually represent an object with it – there was lots of poking and prodding and squashing. Mix 2 cups of plain flour, 4 tablespoons of cream of tartar, 2 tablespoons of cooking oil, 1 cup of salt and 2 cups of water in a saucepan and stir over a medium heat for 3-5 minutes until the mixture congeals. Allow to cool then add a few drop of colouring and knead the playdough until the food colouring is easily mixed through and the dough is smooth. – You can also add the liquid food colouring to the pot as well. I also find that if you knead the playdough with a little flour as it is cooling you get a better result. Playing with colour – make two or more colours and allow your children to mix it up, add sparkly glitter. That book sounds great. I'll have to get a copy and have a read. We do seem to have lots in common. Thank you for your comment, I really enjoy your blog too. Thanks for the recipe, it was a great help. I tried the recipe and the dough turned out well. It was lumpy in the beginning but the more I knead the smoother the texture. So, thank you for sharing it!!! !